The ‘Run Maha Baramee Prataat Chedi 2553 edition of amulets (Click to see amulets from this edition and others by Ajarn Somrach), had its Puttapisek empowerment and blessing Ceremony on Monday 26 March, which is the Thai Chinese ‘Trus Jin’ festival (Chinese festival). It was also the occasion of a Solar Eclipse, which is seen as perhaps the most powerful time for an empowerment ceremony. Ajarn Somrach was the Master of Ceremonies. When the astrological alignments were in place (at 15:39 in the afternoon), and the Solar Eclipse came into its cusp, Ajarn Somrach began to recite the ‘Chumnum Taewada’ (invitiation to the Deities to come and be present to listen to the Dhamma), and invited the Devas, Devata and Brahmas in the Heavenly Realms to come down and be witnesses, and to help in the empowerment ceremony of the amulets. Then he invoked the Baramee and power of the various Kroo Ba Ajarn. Luang Phu Chern (Wat Ta Ee, Buriram) was present to preside over the Chanting as head of ceremonies for the Sangha. Many other great Master Monks came to join in the empowerment ceremony, such as Luang Phu Som, and a host of Ajarn who ware famous for their Maha sanaeh magic power. 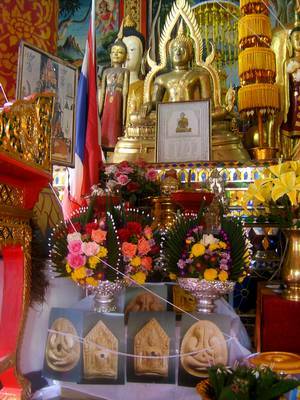 They chanted to invite and ask the Baramee of Pra Khun Phaen to come and reside within the amulets, and give its blessing. The empowerment ceremony continued for over 2 hours, after which, the amulets were taken and kept in the hom of the sponsor who financed the amulets. In the middle of the night, , something strange happened; The whole house,roof, windows and furniture began to shake as if there was an earthquake! (no earthquakes officially reported that evening). Once the empowerment was complete, Ajarn Somrach took them and contined to empower them and impress Jhanic power into them for one ‘Traimas’ (three months), to make the amulets extremely powerful. After the first empowerment and Ajarn Somrachs consequent Trisemestral personal Jhanic empowerment of the amulets, a second ceremony was arranged to re-empower them with even more magic. 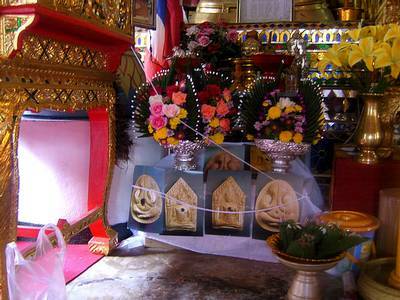 The ceremony was held at the main Shrine room of Wat Mae Sab Nuea in Sameng, Chiang Mai. 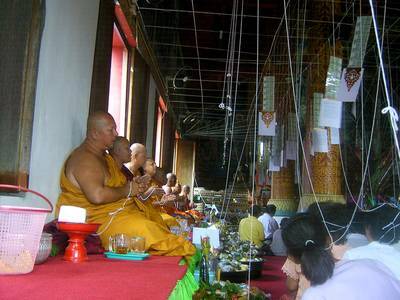 The ceremony was held on the 6th July 2552, which is the day when Thai Budsdhists of the Lanna tradition celebrate the cleaning and tracing of Astrological influences/Fate. 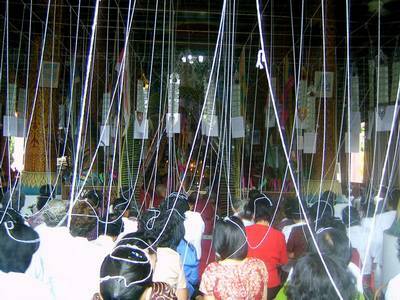 11 Monks were present to Chant Kata and Puttamontr (Buddhist prayers), as well as to chant the Buddhacayamangkalakata (Kata of the victories of Buddha), to give auspicious blessings to the amulets.